For an effective market-based economy, there must be legal systems and processes that protect property rights and economic opportunities on behalf of individuals who lack traditional political and economic powers. To engender investment and jobs, laws and legal institutions must provide an environment conducive to economic activity. Enforcing contracts becomes an integral part of an open business environment. Post-2015, India witnessed a huge drive towards improving the ease of doing business, as part of the economic agenda of the central government. This was supplemented by a 340-point Business Reform Action Plan (BRAP), which listed key recommendations and action points to actualize this goal. 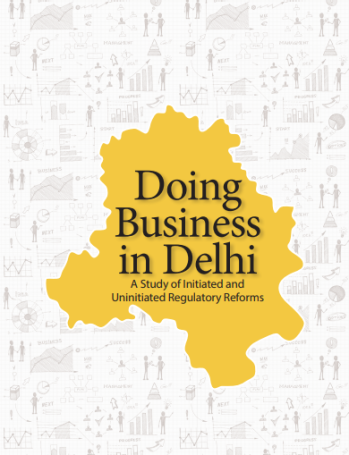 Despite a better overall rank in terms of the Doing Business index of the World Bank, India has consistently ranked in the bottom 30 on the issue of contract enforcement. The BRAP 2017 recommended that state governments set up specialised commercial courts to focus on commercial disputes exclusively. It also suggested that 90% of the vacancies for the post of judges be filled by new recruitments, timelines be defined and adhered to for first hearings, and filing of defence statements, submission of evidence, filing of expert testimonies and submission of final judgements be ensured (Department of Industrial Policy and Promotion 2017). Self-reported evidence from the Government of National Capital Territory of Delhi (GoNCT) to Department of Industrial Policy and Promotion (DIPP) shows that Delhi is yet to implement the recommendation regarding fulfilling vacancies and specifying timelines. The government has, however, instituted a commercial division in the High Court of Delhi under the Commercial Courts, Commercial Division and Commercial Appellate Division of High Courts Act, 2015. The Act defined and categorised commercial suits to be civil suits above a specified value of Rs. 1 crore (Rs. 10 million). These cases were to be tried by a specialised commercial bench launched in the High Court of Delhi in November 2015 (Press Information Bureau 2015). However, the commercial bench continues to adjudicate other civil disputes apart from hearing commercial disputes. More time was spent on noncommercial cases, the time spent on commercial disputes was not proportional to the level of pending commercial cases, and the time available with judges was likely not proportionally assigned between commercial and noncommercial cases. While a commercial bench was instituted at the High Court of Delhi, it did not serve to drive a specialised Court approach. Even though the time available per judge per case at the High Court of Delhi has increased over the past 6 years, no specific slots have been dedicated to commercial disputes. In fact, a large amount of the Court's time is taken up by other civil disputes, leaving little time for commercial cases. The time spent on commercial versus noncommercial original-side cases is not proportional to the relative pendency of commercial disputes to noncommercial disputes. It is also unclear to what extent the surprisingly low disposal time for commercial cases will be affected by the changes in the handling of commercial disputes. The changes in the pecuniary jurisdiction can increase the caseload of the High Court of Delhi. In addition, since not much has changed in how the Court functions, substantial judicial efficiency gains may be some distance away. Ultimately the goal of bringing focus to commercial disputes, as recommended by the BRAP, may not be achieved in the absence of a specialised court. The 'Ease of Doing Business' (EoDB) index incorporates judicial efficiency in its ranking methodology. Under the head 'Enforcing Contracts', the report measures the time and cost taken to resolve a commercial dispute. These include the time taken to file and serve a case, time taken for trial, judgement and enforcement of a contract, average attorney fees and court and enforcement charges. In the 2018 EoDB index, the mean time to solve a commercial dispute in India was found to be 1445 days, placing us at 164 out of 190 ranked countries (World Bank 2018). To improve the business environment in the country, particularly to reduce the time and the cost of enforcing contracts, the DIPP of the Government of India recommended the institution of exclusive commercial courts at the High Court and District Court levels in 2015. According to the Business Reform Action Plan (BRAP) 2017 of the DIPP, 'these specialised commercial courts at High Courts and District Courts could focus on contract disputes exclusively, reducing the requirement for complainants and defendants to wait for delayed judgements through the regular court system'. Such reforms have yielded positive results in different parts of the world such as Uganda and England. While a commercial bench was instituted in the High Court of Delhi in 2015, the bench does not exclusively look at commercial disputes. This marks a deviation from the original intent to fast-track commercial disputes through a specialised commercial court system. While Courts are scheduled to work for 5 hours each day, the Court was actually in session for about 3.5 hours on average. This amounted to a loss of approximately 35 working hours annually per courtroom in the High Court of Delhi, or more than 3% of the total number of working hours. Looking at the absolute value of the time spent on commercial cases, commercial disputes were given less time as opposed to noncommercial original-side cases. Further, 64.25% of the commercial cases before the Court were given less than 5 minutes. Across the 9 days in the three courtrooms, the cumulative time spent on noncommercial original-side jurisdiction was 2.73 times as much that on commercial disputes. In general, less than 65% of the total working hours of the court were spent on substantive matters and about 32% on procedural matters and adjournments across the three courts, over the 9-day period. The provisions introduced by the Commercial Courts Act, 2015, streamlined various judicial tasks. Many procedural activities (e.g. recording evidence and witness statements) have now been brought under the purview of Judicial Registrars and Local Commissioners, thus saving the time of the Court. Despite that, in many cases, there was frequent back-and-forth between the parties and counsel over core issues, filing and evidence. This ended up requiring the discretion of the judge and, consequently, the time of the Court. Despite the fact that commercial cases were given less hearing time compared with noncommercial original-side disputes, the time-and-motion study found that commercial cases took lesser time on procedural matters and more time on substantive matters than noncommercial cases. The time spent on substantive stage for commercial disputes was 7.32 percentage points higher compared with all original-side cases. As of 17 July 2018, 41.43% of all pending civil original-side cases at the High Court of Delhi were commercial cases. Given the commercial bench has jurisdiction over both categories, this pendency proportion was compared to the time spent on commercial disputes in the time-and-motion study. The actual time spent on commercial original-side disputes, as opposed to noncommercial original-side disputes, was limited to 26.79%. 37.97% of the cases were decreed and 40% of the cases were either withdrawn or settled. Given the high mean disposal time for decreed cases, one might assume that full hearings took a long time for resolution. However, more outliers were observed within decreed cases, skewing the overall mean upwards. When the median disposal time was considered, the average was actually lower for decreed cases. At a closer examination, more than 80% of the decreed and settled cases had similar disposal time, thus indicating little difference between the two.